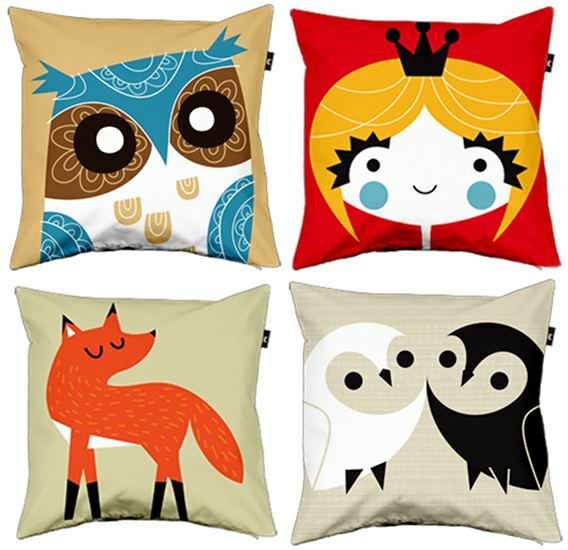 We’re already huge fans of this lovely Melbourne designer and we’ve just noticed she now has cushions available! Little Beehive is the undeniably charming label by graphic artist Bee, whom we had the pleasure of meeting at the recent Kids Instyle trade show. She’s every bit as delightful and bubbly as her work – it truly is an extension of her bright personality! Now just look at these glorious cushions. I want one of each please, despite my partner’s constant complaining about the amount of cushions taking over our home. I’d throw them all out in an instant for just one of these delicious pieces. We featured the art, cards and invites from Little Beehive in January and just love this extension of Bee’s talent. The cushions are available at her Envelop store in a range of sizes and styles from about $30 a piece plus shipping.